Cannabis-detecting receptors are in both adult and embryonic brains. But what is their purpose? Zsolt Lenkei has an intriguing theory, and this could tell us why cannabis users can be at an increased risk of developing schizophrenia. Zsolt - These receptors are sensitive to neurotransmitters and they are also sensitive to cannabis and we were mapping the localization of these proteins and we were very surprised that we found a lot of these receptors in very young developing neurons. And this was surprising because these receptors are mostly known as the regulator of synaptic transmission between neuronal cells. Chris - Why were you surprised that there should be so much of the activity of these receptors in a developing brain because after all, it's producing lots and lots of nerve cells and it's producing lots and lots of connections between nerve cells as those cells develop the brain. Zsolt - We we're surprised because the expression of this receptor, came very early. When neurons just started to be defined as neuronal cells, the did not have any axons or dendrites. The expression of these receptors was very high during the growth of these neurites during the axons that grow to contact either brain regions. And very surprisingly when these regions were reached and synapses started to form, these receptors just started to disappear from neurons. Chris - Do you think that that might be because when you've got a developing brain and you want cells to grow a bit, if you let them connect too soon they may make lots of aberrant local connections and not grow to their target before they start connecting to it. Could it be that that's also part of the issue. Zsolt - Absolutely. Correct connections are very highly regulated in the brain. In order to have the right number of connections, cannabinoid receptors are working as a brake. We started to think that maybe in developing neurons, they can also have a role at braking growth. Chris - So how can one find out whether or not these endocannobinoid receptors are stopping nerve cells connecting to each other albeit prematurely? Zsolt - So in the beginning, we were growing neurons in dishes and we treated these neurons with pharmacological ligands, molecules that would either stimulate or block the activation of this receptor and we have found that molecules that activate the receptor will lead to neurons that grow shorter axons and less dendrites. While blocking this receptor led to neurons that had longer or more developed neurites. Then we wanted to have a closer look at the mechanism of these negative regulator effect so we set up endomicroscopy. So we have young neurons from the embryonic rat brain in a dish. 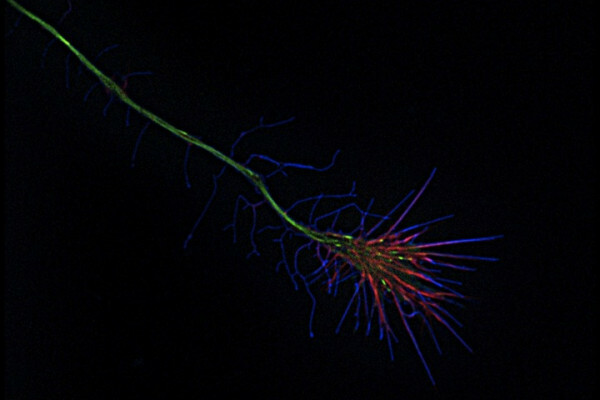 We transformed genetically these neurons so fluorescent molecules be label microtubules and also that cytoskeleton. We put these neurons under a microscope where we filmed 20 or 30 neurons typically one or two hours and we were very surprised because as soon as we put molecules that stimulate the activation of the receptor growth cones of the growing axons responded with a very strong contraction. Chris - So on the surfaces of these growth cones which are the structures that the developing nerve are putting out to grow and find a target ultimately to connect to it. There are receptors for these endocannabinoids. If you stimulate those receptors this makes the growth cone collapse and retract. Do you understand what's going on in the cell to force that retraction? Zsolt - Simply by looking at the contracting growth cone we have seen that F-actin which is an important cytoskeletal polymer, is redistributed exactly at the places where the contraction takes place. Chris - So putting all this together, what we've got is nerve cells from very early on in development are expressing a receptor for the brain's own cannabis-like chemicals. This receptor is connected to systems that can rearrange the cells skeleton and this leads to the forcible retraction of these growth cones. Just extrapolating this we know that there's an association between cannabis use and psychosis. Do you think that there could be a connection here? Excuse the pun. Zsolt - The brain is very sensitive to cannabis in the adolescent period. In the adolescent brain, there is a final large-scale remodelling of connections mostly in regions which are important for cognitive functions. And interestingly in brain areas which are remodelling in the late adolescent period, you find a lot of cannabis receptors. So overstimulation by heavy cannabis use may lead to large-scale remodelling. These individuals will have less connections and psychosis is known as connectivity disease so these molecular mechanisms that we described can explain why psychosis will develop in these individuals.